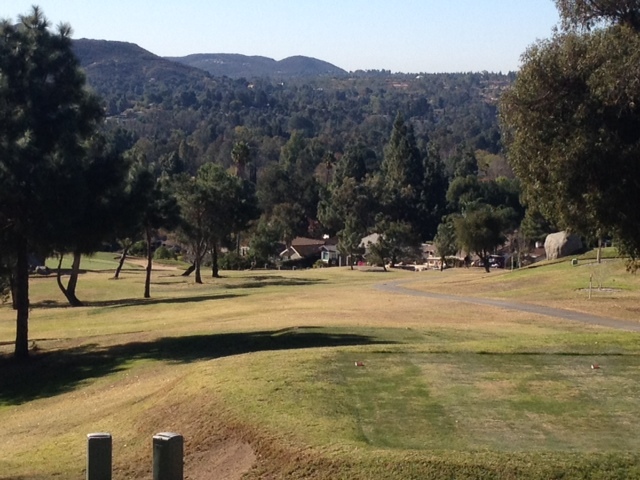 If you haven’t played Stoneridge County Club in Poway, it’s now publicly available on Mondays at Golfnow.com. It’s an interesting layout with a distinct split personality. The front nine alternates between rolling and flat terrain while the back features drastic elevation changes on nearly every hole. Your back-nine roller-coaster ride comes to an end at No. 18, which is a tricky finishing hole for first-timers. The yardage (424 yards from the blues) says driver, but that’s not the play here. This is a pure position hole. No. 18 is a dog-leg left from an elevated tee with a second shot played to a partial island green buffeted by four towering palms. It’s a great way to finish in that it’s by far the best view of the course, but it’s also a potential birdie hole if you play it right. The key here is to be middle or right off the tee. Left is dead in that you can end up in a sand trip that rings a cluster of boulders (see photo below), or you could also end up blocked by trees. A hybrid or long iron is plenty of club off the tee here since you’ll get a big yardage bump from the downslope. Then it’s a just a short iron into a smallish green with a huge sand trap looming on the right. As with every hole at Stoneridge, the challenge comes on the green, where you face some of the swiftest green speeds in San Diego County. They were humming along at a 13 the day I played. The greens are in terrific shape right now while other parts of the course are a little rough maintenance-wise, but you still get the gist of the experience. 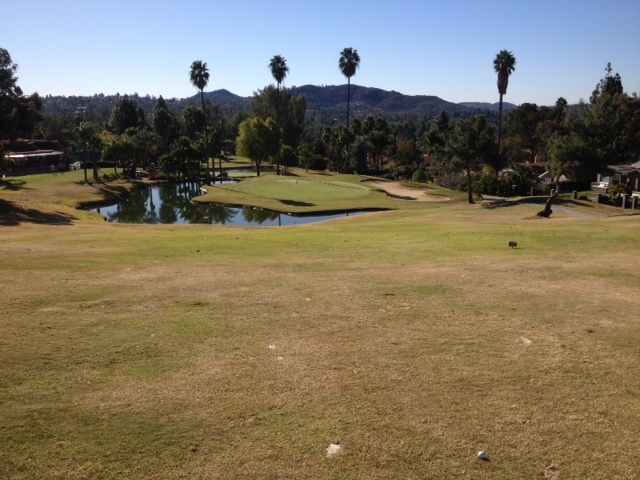 I’ve cruised through the front nine twice nine while crashing my round on the back nine. Like I said, it’s two very different golf experiences, the second half of which requires a little course knowledge to be successful. So be prepared to take your licks the first time around, but at least you know what to do now once you reach No. 18. Good luck, if you go. 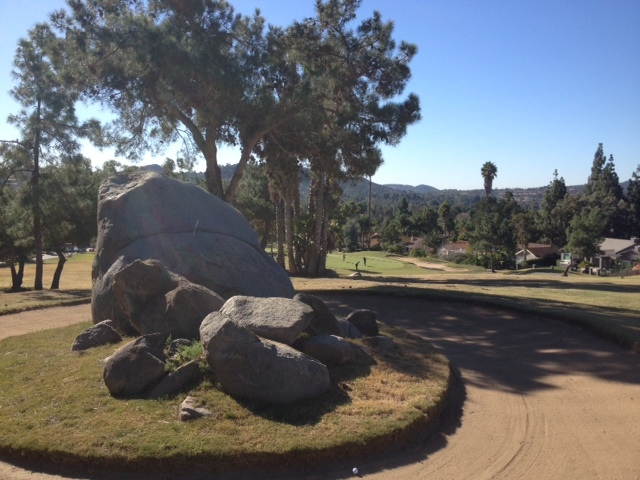 This entry was tagged Poway, Stoneridge County Club. Bookmark the permalink.